Welcome to Ron Gordon Watch Repair. My shop is conveniently located in Midtown New York City. My workshop is equipped with modern state of the art machinery to handle all phases of watch repair, water resistant testing and case and bracelet refinishing. I have over 30 years of experience and knowledge with the tools to do the job right. All work is done in house. 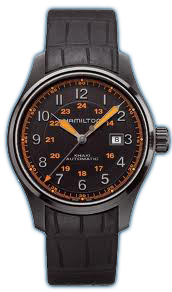 I am an authorized Hamilton watch repair shop in New York, NY. I am a certified, professional watch repairman who can execute authorized repairs on your luxury Hamilton watch at a reasonable cost. The Hamilton Watch Co. started up in Lancaster, PA in the middle 1890’s from the start, it positioned itself as a manufacturer of quality watches. For about 50 years, over 50% of the pocket watches it produced were the high grade necessary for use in the railroad market. At least two of its railroad grade watches were produced in quantities of more than a half of a million each over a period of decades. Hamilton was successful through the 1920s, buying the Illinois Watch Co. in 1928. Production ceased in the U.S. in 1969, although watches were still be assembled from parts and finished for several more years. The Swatch group now owns it. If you want your fine timepiece to last a lifetime you should have it serviced regularly. Hamilton recommends this be done every 4-5 years. Here are the 2 types of repair Hamilton recommends. Final technical inspection and 72-hour test. If you love your Hamilton watch and want to have it repaired I am happy to discuss this with you anytime. Just give me a call or send a quick email! If you love your Hamilton watch and want to have it repaired I am happy to discuss this with you anytime. Just give me a call or send a quick email! We at Ron Gordon Watches also repair other watch brands such as Tag Heuer, Breitling, Longines, Hamilton, Omega, Rado, Rolex, Citizen, Tissot, Jaeger LeCoultre, and other major luxury watch brands. If you are a lover of luxury watches and/or need luxury watch repair, please reach out to Ron Gordon, personally, to repair your beloved timepiece!